With ultramodern styling, the 90 Degree collection is a study in minimalism. Geometric forms, squared corners and straight lines create an urban focal point for today's contemporary baths. Let this collection help you discover ways to turn your day-to-day tasks into extraordinary experiences. Elegantly simple, the Glyde collection s graceful curves and contours flow as beautifully as the faucet s water stream. This creates a transitional style that spans a variety of decorating trends. This trim kit requires MOEN valve 2520 to complete installation. Wynford is a traditional styled bath suite that has updated, classic details with clean, refined design cues. This allows the Wynford tub and shower faucet to work across multiple decorating styles. The smooth single-handle design make it easy to adjust the water to just the right temperature. This trim kit requires MOEN valve 2510, 2520, 2570, 2580, or 2590 to complete installation. Waterhill Brushed Nickel Posi-Temp Tub/Shower (Valve Sold Separately) With ultramodern styling, the 90 Degree collection is a study in minimalism. Geometric forms, squared corners and straight lines create an urban focal point for today's contemporary baths. 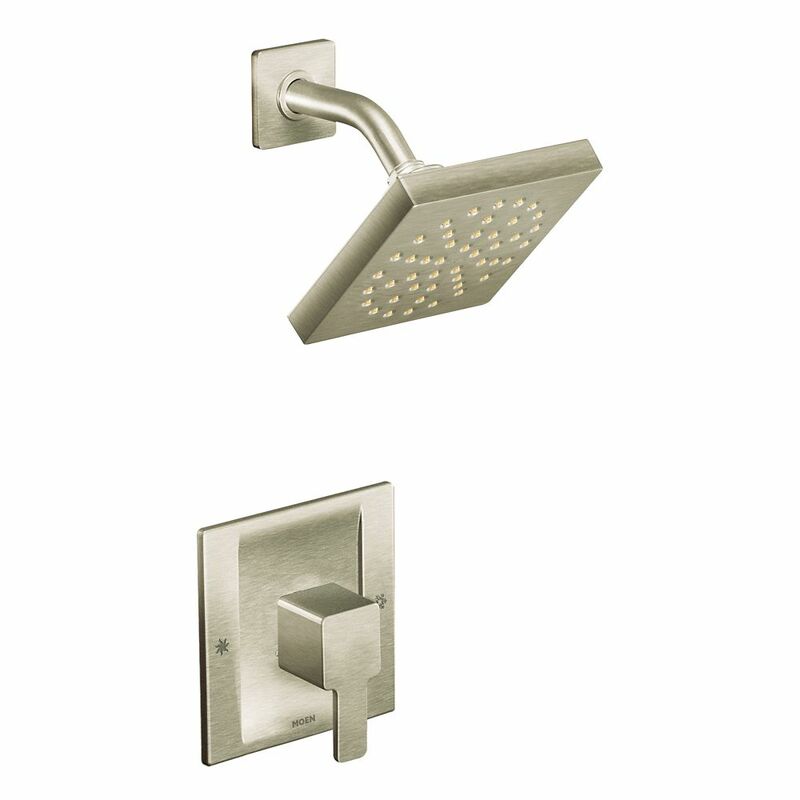 Waterhill Brushed Nickel Posi-Temp Tub/Shower (Valve Sold Separately) is rated 5.0 out of 5 by 2. Rated 5 out of 5 by Anonymous from Quality product I am very much pleased. I have purchased many Moen products in the past and have not been disappointed. Good pressure for a rain head. Looks great. Rated 5 out of 5 by Spitty from Very nice but definitely expensive! Did both bathrooms all in 90 Degree finish. Looks modern and classy! Very nice but definitely expensive! Did both bathrooms all in 90 Degree finish. Looks modern and classy!